Home › Home and Kitchen › Starbucks Sbk11008131 Colombian Via Ready Instant Single Serving Brew (Pack O..
Starbucks Sbk11008131 Colombian Via Ready Instant Single Serving Brew (Pack O.. 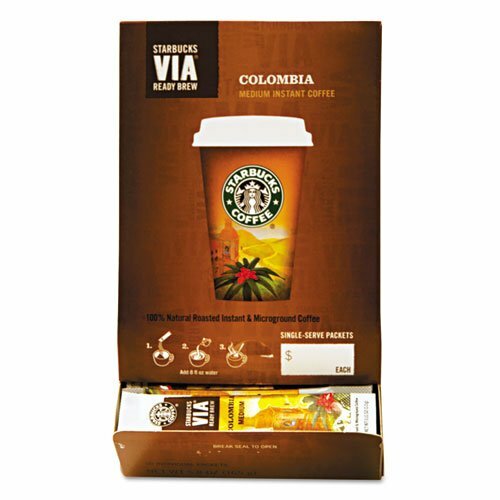 VIA Ready Brew Colombia Coffee delivers a medium-roasted, well-balanced cup ofinstant coffee that you can enjoy anywhere. Simply open the single-servepacket, mix with hot water, let coffee brew for 10 seconds and stir.Proprietary, all-natural process micro grinds the coffee in a way thatpreserves all of the essential oils and flavor. 100 percent Colombian Arabicacoffee offers a rich, smooth taste with that signature walnut-like taste foundin great Colombian coffees.